Sarah Palin is calling the latest Newsweek cover — taken from an August Runner's World shoot she did — "sexist and oh-so-expected by now," adding, "the media will do anything to draw attention." She's right. The choice of photo for the cover of this week's Newsweek is unfortunate. When it comes to Sarah Palin, this "news" magazine has relished focusing on the irrelevant rather than the relevant. The Runner's World magazine one-page profile for which this photo was taken was all about health and fitness – a subject to which I am devoted and which is critically important to this nation. The out-of-context Newsweek approach is sexist and oh-so-expected by now. If anyone can learn anything from it: it shows why you shouldn't judge a book by its cover, gender, or color of skin. The media will do anything to draw attention – even if out of context. 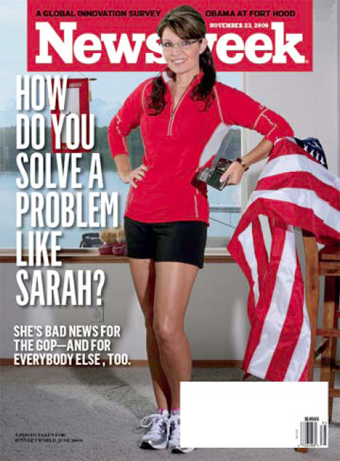 First things first: Sarah Palin chose to pose for these photos in Runner's World. Yes, her commitment to exercise is proven and admirable. But she had to have known by then that the cheerleader-esque photos could be used against her. As the Washington Post's Robin Givhan pointed out in an appearance Friday, the obsession with say, Palin's red pumps may have been disproportionate, but she still sent a message by choosing them. Still, Newsweek isn't exactly exercising its commitment to as be as "intellectually satisfying and as visually rich an experience as the great monthlies of old," in the words of its editor not long ago. But sparring with Palin and her defenders has been a lucrative strategy for Newsweek (and just about everyone else). It started with its September 15, 2008 cover, which used a 2002 file photo of Palin wielding a gun. The age of the photo was disclosed, but a casual observer would be easily forgiven for thinking that Palin had just posed for the photo during the campaign season. And then there was the second Palin-Newsweek-cover brouhaha, which consisted of Fox news commentators complaining that the closeup shot had been insufficiently airbrushed. Newsweek probably couldn't have anticipated such a ridiculous complaint. Still, both cover photos paid off both in news cycle buzz and at the newsstand: each Palin issue was that month's best-seller, according to the Audit Bureau of Circulations. And let's not forget that this is a magazine for whom a "glimmer of progress" boils down to "we laid off enough people and cut unprofitable circulation to lose less money this quarter than the first two." So far, a major prong of their strategy for stepping out of the muddy middle, away from rusty, team-reported grand narratives, amounts to so much page-view whoring. It's all new packaging for newly sharp-edged commentary — some of it quite nuanced and progressive — from the same old, mostly white and male, voices. So why not go in for another piece of Palin? After all, we're buying. Bonus: The ladies of the View are pretty much united in outrage on this one. Earlier: The Sarah Palin Non-Photoshop Chop: Fox News Wants To Alter Your Reality.